SÃO PAULO, BRAZIL – With a little more than ten months to go before the start of the 2016 Olympic and Paralympic Games in Rio de Janeiro, Brazil, organizers have announced the opening up of more than 90,000 temporary jobs in the city in 2016. According to the Rio 2016 Organizing Committee, the Olympic Committee itself will be opening up five thousand posts, while the events many suppliers will be offering 85,000 other temporary positions. 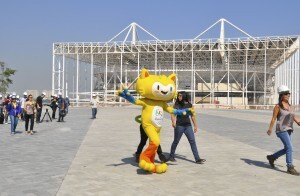 Rio 2016 mascot visiting Olympic facilities. Committee has announced plans to hire thousands for games, photo by Tania Rego/Agencia Brasil. “The jobs will start to be filled in January, and then [hiring] will occur more intensely in May and June,” said Henrique Gonzales, Human Resources Director for Rio 2016 this week to O Globo. According to Gonzales all those chosen will receive training. According to organizers the salaries for the temporary jobs will range from R$1.5 to R$6 thousand for those hired by the Committee while the salaries for those working for the suppliers will be determined by the individual companies. Thousands of volunteers are also expected to help out with the games. The selection will be made by the Rio 2016 committee and recruiting firm Manpower Group. According to Manpower CEO, Ricardo Barseris the company expects 50,000 people to apply for the 5,000 positions in the Olympic Organizing Committee. Contracts will last anywhere from 3 to 9 months and individuals will have benefits such as health insurance, meal plan ticket and transportation vouchers. The organization has previously stated that it will help foreigners chosen for the positions to obtain work visas. According to committee officials the main characteristics the candidates should have are pro-active personality and empathy. Although fluency in English is desirable it is not a requirement. Candidates must be at least eighteen years-old to apply for the positions. To apply, candidates must upload their resumes at website https://www.talentosmanpowergroup.com.br.